The Peoples Democratic Party’s (PDP) presidential candidate, Alhaji Atiku Abubakar, Wednesday signed the peace accord, stating, however, that the best way to guarantee peace in any election, or any human interaction, is to ensure evident justice to all concern, appealing to President Muhammadu Buhari to assent to the Electoral Act (Amendment Bill) 2018. While promising to abide with the terms of the accord, he said, “I’m delighted that Mr. President has agreed to sign this peace accord, but we want to appeal to him to also sign the Electoral Act (Amendment) Bill 2018. Also, contrary to media report yesterday, the National Peace Committee led by former Head of State, Gen. Abdulsalami Abubakar (rtd), said at the signing event that PDP did not boycott the signing of the peace accord on Tuesday, apologising to the party for the omission. On its part, the ruling All Progressives Congress (APC) yesterday claimed that the presidential candidate of PDP tried to avoid signing of the accord. 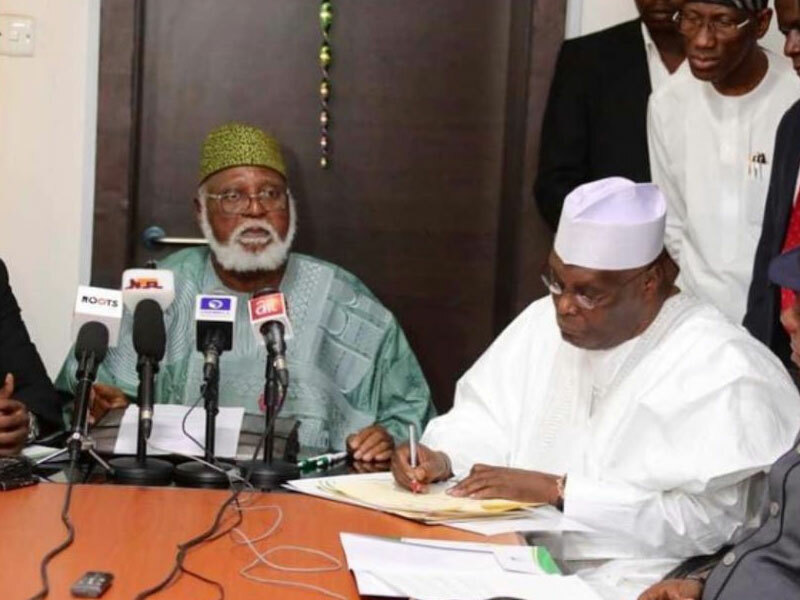 Abubakar, who spoke when Atiku in company with party chieftains visited the Bishop Mathew Kukah centre in Abuja to sign the peace accord, said the clarification became imperative in order to disabuse the minds of Nigerians that thought the party boycotted the peace agreement. He said, “As you are all aware yesterday (Tuesday) we signed the peace accord, which was signed by quite a number of registered party chairmen and their presidential candidates. I want to apologise for the omission that PDP was not able to attend that ceremony. “In order to dispel the views that PDP boycotted this signing of the accord yesterday (Tuesday) was completely wrong. I spoke to the presidential candidate and the party officials in order to disabuse the mind of people and to make Nigerians aware that everybody involved cares for peace and wants a peaceful election. Speaking after signing the accord, Atiku said that PDP was committed to a peaceful, fair and credible elections. He stated, “We have always said that and we believe in that. I am a democrat, ab initio; I was never converted; I have always being a democrat and I fought the military to return this country to democracy. According to the peace accord, the presidential candidates who signed the peace accord, agreed to run issue-based campaigns at national, state and local government levels, pledging to refrain from campaigns that will involve religious incitements, ethnic or tribal profiling, both by themselves and their agents. They also agreed to refrain from making or causing to make in their names and that of their parties, any public statements, pronouncements, declarations or speeches that have the capacity to incite any form of violence, before, during and after the elections; to commit themselves and political parties to the monitoring of the adherence to the accord by a National Peace Committee made up of respected statesmen and women, traditional and religious leaders. Meanwhile, at the first interaction of Atiku with various women groups in Abuja, he assured that women would play a leading role in his administration. He said when PDP was in power, the party advanced the interest of women, assuring that if voted into power he would commit to a strong representation of women in his administration. While fielding questions from the women groups, he stressed that since the population of women is about 50% of the country’s population, representatives of the people at all levels must reflect the population. “Some will argue that gender disparity is a deal that cannot be achieved overnight, I disagree, we can achieve it; the PDP almost achieved it until the government of APC came and took you back again,’’ the PDP presidential hopeful stated. On injustice being allegedly committed by security agencies, Atiku said, “These security agencies have sworn their allegiance to the Federal Republic of Nigeria not to a particular government and not to a particular individual. However, the ruling All Progressives Congress (APC) yesterday claimed it is obvious that the presidential candidate of PDP tried to avoid signing the national peace accord, ahead of the country’s 2019 general elections. ‘’To all discerning Nigerians, the PDP and Atiku’s dubious claim of a communication lapse as reason for their no-show at Tuesday’s formal signing ceremony is hogwash, as the peace committee duly and formally invited the PDP and Atiku like other candidates and political parties contesting the 2019 Elections,’’ Mallam Lanre Issa-Onilu, the National Publicity Secretary of APC stated wednesday. He added, ‘’Atiku’s eventual decision to sign the peace deal is clearly a face-saving move following widespread condemnation that greeted his initial refusal to agree to the peace deal. We, however, must not lose sight of the dangerous and ominous signs the PDP and Atiku have inadvertently shown Nigerians in the lead-up to the elections. 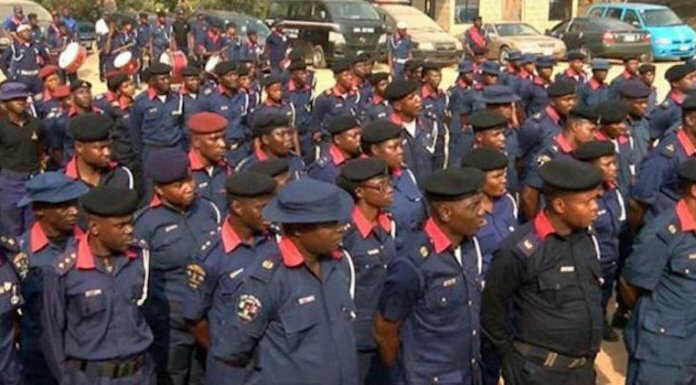 The APC reiterated that security and other relevant agencies must be on high alert to check this alleged dangerous threat posed by the PDP’s planned actions for the general elections. Meanwhile, the former Minister of Solid Minerals Development and the presidential candidate of the Allied Congress Party of Nigeria (ACPN), Mrs. Oby Ezekwesili, has accused Buhari of refusing to sign the electoral reform bill for personal interest. Speaking on a morning programme on Ray-power FM, Ezekwesili said that most Nigerians had expected the president to cue into the effort to sanitize the country’s electoral process by assenting to the amendment bill. However, Ezekwesili said by vetoing the bill four times, the president may be wittingly or unwittingly giving the impression that he is encouraging political corruption. “Mr. President doesn’t want to sign the Electoral Act (Amendment) Bill, but he just joyfully went and signed the peace accord. It is very clear that the president is running away from the provisions of the bill that when it translates to an Act, it will checkmate any shenanigans,” she said. The presidential candidate said she had earlier in a press statement called on the president to do what is right for Nigerians and make sure he signs the bill. “The president cannot practice what is called political corruption by using his exalted office to further his personal interests. According to Transparency International, any time a person uses public office for personal gains, that person is practising corruption and I hope that the president is well advised to do what is right for Nigerians that has given him so much,” she said. Ezekwesili said the next option open to Nigerians under the circumstances is for the National Assembly to take measures to override the president’s veto. ” We need an Electoral Act that will lead to an improvement of the 2015 election and not anything that will be in retrogression,” she said.